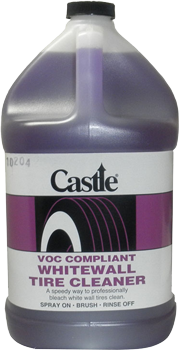 Castle® White Wall™ is a high alkaline cleaner with a blend of surfactants for heavy duty cleaning. 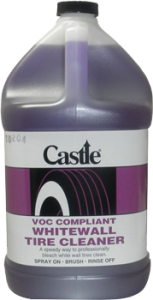 This fast-acting formula dissolves grease, grime, and dirt, while protecting white walls from yellowing. Do not spray on aluminum or magnesium wheels. Lemon scented.